Some of you may be shouting aloud "Oh look a beaver!!!" Unfortunately your excitement will turn to disappointment very quickly when I tell you it's a muskrat. This animal is really part musk ox and part rat. I know this because the part that is rat, is the tail. Man, oh man, does it have a tail like a rat! I'm still not clear as to how it relates to a musk ox. I'm going to assume it's the smell. 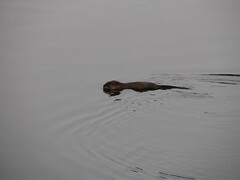 Even if I hadn't seen this animals "rat-like" tail I could tell it wasn't a beaver for two reasons. One, there isn't a single tree where I spotted this muskrat. Two, also tree related, a beaver needs to gnaw on trees to keep their teeth ground down or else their teeth would grow into their skulls. In a way it seems the beaver has much more in common with the musk ox. Because if it allows it's teeth to grow, they'll grow out the back of it's skull giving the appearance of having antlers just like the musk ox. The bottom line is I don't know how the musk ox and musk rat are related but the photo above is clearly not a beaver.